More than 100,000 alligators live from the Midlands to the coast of South Carolina, and the population is not threatened by the regulated removal of a relatively small number of alligators. Last year, hunters took 333 alligators during the public alligator hunting season, with the average size being nearly nine feet in length. A $10 nonrefundable application fee is required to apply for the Public Lands Hunt, and a $15 nonrefundable application fee is charged to apply for the Wildlife Management Area (WMA) Alligator Hunt. A randomized computer drawing based on a preference point system will determine the selection of hunters. Applicants can only apply and pay fees online or at one of the walk-up counters at a S.C. Department of Natural Resources (DNR) regional office in Clemson, Florence, Columbia or Charleston. No paper applications will be accepted. This year’s season will begin at 12 p.m. (noon) on Sept. 10 and run until 12 p.m. (noon) on Oct. 8. The deadline to apply is June 15. If selected, a $100 fee for the permit and one harvest tag is required to be paid online through the same online alligator hunting application system. Unsuccessful applicants will accumulate preference points for future alligator hunt drawings. Preference points add to the likelihood of being drawn in future years. All hunters will be notified beginning in mid-July of their selection status. Hunters participating in the Public Alligator Hunting Season may take alligators in public waters and on private land where permission is granted, but alligator hunting is prohibited on Wildlife Management Areas and U.S. Fish and Wildlife Service wildlife refuges. In addition, public alligator season permits cannot be used on lands enrolled in the Private Lands Alligator Program. The WMA Alligator Hunt is a special draw hunt, in which the person selected will be permitted to take up to three assistants and have access to either portions of Bear Island WMA or Santee Coastal WMA for one hunt period (Monday at noon to Saturday at noon). There are four available hunt periods during the WMA alligator hunting season. 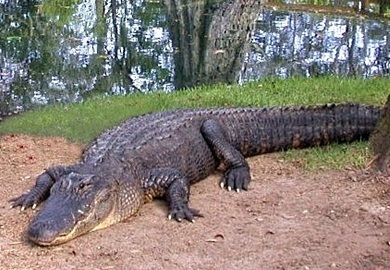 The cost for the WMA Alligator Hunting Permit, if successfully selected in the computerized drawing, is $500 for residents and $800 for nonresidents. There are two available permits for each hunt period on both Bear Island WMA and Santee Coastal WMA, for a total of four hunters (plus assistants) per week, and 16 total available permits per season. All hunters must have a hunting license, WMA permit, and if a nonresident, pay the nonresident alligator hunting fee. In addition, there is the availability of a second WMA tag for an alligator from 4-7 feet in total length. The second WMA tag may be used by anyone in the hunt party provided the person to whom the tag was originally issued is present. The cost for the second WMA tag is $75, in addition to all other fees and must be purchased at the same time as the first tag. The additional WMA tag is only valid during the chosen week for the selected WMA property. By law, the fees collected are used to support the Alligator Management Program's research and management activities, and for conservation of the American Alligator in South Carolina. Only alligators 4 feet or greater in length may be taken and the hunter must tag the animal immediately with a harvest tag provided by DNR for any of the alligator hunting programs. This hunting season does not allow the shooting of unsecured alligators, even on private land. All alligators must be secured using approved equipment and brought boat-side or onto land before they can be dispatched. While others may assist the permitted hunter, all participants (including permittee) must possess a valid South Carolina hunting license. All selected hunters and participants in the WMA Alligator Hunts must also possess a Wildlife Management Area permit. In addition to the required S.C. hunting license, application, and permit fees, all nonresident alligator hunters are required to pay an added nonresident alligator hunting fee of $200 before going afield. This fee is valid for participation in any of the alligator hunting programs. The nonresident alligator hunting fee is also required for any nonresident alligator hunting assistants 16 years of age or older. While the hunters selected for the WMA Alligator Hunt can only hunt on the designated WMA during their designated hunt period, the WMA alligator permit does allow the hunter to hunt alligators in the Alligator Management Unit in which the WMA is located. Thus, WMA permit holders for Santee Coastal Reserve can also hunt in the Middle Coastal Unit and the WMA permit holders for Bear Island can also hunt in the Southern Coastal Alligator Management Unit. However, the optional additional WMA tag for taking an alligator from 4-7 feet in length is only valid during the selected week (Monday to Saturday) and only on the selected WMA. DNR will closely monitor these hunts and the harvest and regulations may be modified for future seasons. Please check the DNR website at www.dnr.sc.gov/wildlife/alligator/index.html for any changes and updates.